Q: Did you have much to do with studio head Louis B. Mayer? A: Well, I used to go to his house every Sunday to have brunch with his three granddaughters and go horseback riding with them. They were perfectly nice, but it was a command performance so it felt like a job. I did it because I was told to. Oh, and there’s one story about Mr. Mayer that I don’t know if I dare tell you. Q: Well now you have to! A: Okay. I was about six or seven and my mother and I were sitting in Mr. Mayer’s huge outer office in the Thalberg Building with his secretary, Ida Koverman. We were waiting to go into to talk to Mr. Mayer about something. Suddenly this woman I knew quite well opened the door and starting backing out of Mr. Mayer’s office screaming, “Don’t tell me that, L.B., I f**ked all those bastards on my way up!” And with that she slammed the door, and spun around. When she saw me she literally gasped and said, “Oh, hello, Cora Sue, how are you?” She was so embarrassed. We had worked together in the film Smilin’ Through with Leslie Howard where I played her as a child. And, of course, she had been married to Irving Thalberg. Q: Oh my God, Norma Shearer? A: Yes! So after she ran off, I asked my mother, “What does ‘f**k’ mean?” My mother got all flustered and wouldn’t say anything. So I went over to Mrs. Koverman and asked her and she got just as flustered. I looked at both of them and said, “It’s okay. She said it to Mr. Mayer so I’ll just ask him what that word means!” As much as they begged me not to, they couldn’t shut me up and I did ask him! Q: Egads! What did he say? Thanks to Katie for the screenshots! 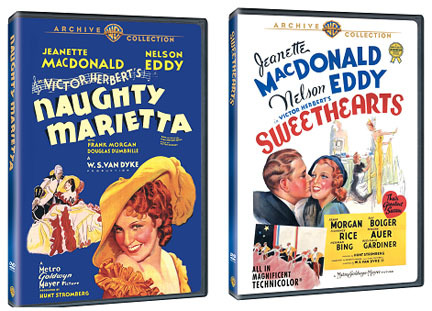 Jeanette MacDonald Nelson Eddy DVD Release Announcement: Naughty Marietta and Sweethearts! These are the first 2 Jeanette-Nelson team films to be released on commercial DVD. UPDATE: They are both available at Amazon.com. Earlier, microphones were known as transmitters. In 1878, Thomas Alva Edison made the first commercial microphone. It was a type of carbon microphone. Later, in Bell Laboratories in 1962, a new type of capacitor microphone was invented. There were a number of microphones which have made their marks over the last few decades. Some of the names went on to create history but now they are a part of the vintage microphones. The early 1930s saw the movie industry trying out new technology to record musical scores. However, the range of microphones offered was low. In came the MGM Studios, in Culver City, CA, to try out the newly invented cardioid mic made by the Siemens Co, Germany. It was used to make “Naughty Marietta” with the likes of Jeanette McDonald and Nelson Eddy.